He was born Heeley 1889 and died 10 July 1918 at home, 13 Rubens Street Sheffield. he is buried in City Road Cemetery Sheffield. 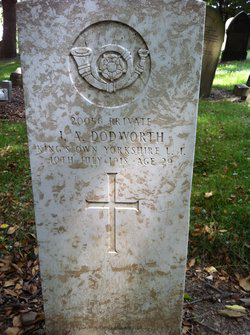 His parents were James Thomas and Matilda Dodworth, and he married Florence Nixon 1912 Sheffield, their children were Jessie Dodworth, b1913 - d1915 and Edna M. Dodworth b1916.